I've been using a lot of my My Beauty Dairy (MBD) masks lately which is why there has been so many MBD masks reviews. I promise the wave will be over soon, I just have a few more to share. 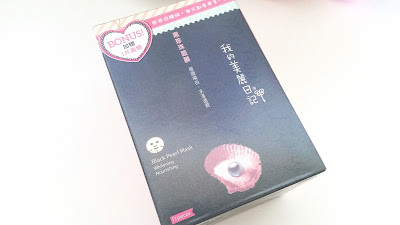 Anyways, back to the main topic of today's post, this here is the My Beauty Diary Black Pearl Mask. I've been using MBD masks for over 6 years now and no doubt I will keep on using them in the future. For me, these are inexpensive masks that works. I can slap one on every night without feeling guilty but I can't say the same about many other masks. Price isn't everything though and obviously there's something good about these MBD masks, otherwise I wouldn't come back for more. 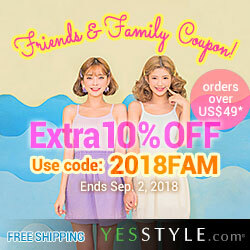 Read on to learn more about them! Product Description: Brightening and nourishing masks that's rich in vitamins, minerals and amino acids. These Black Pearl masks can moisturize and brighten tired skin while rejuvenating it to its original smoothness and softness. The masks can relieve stressed skin and revive it to its fair nature. To Use: Cleanse and tone the skin first. 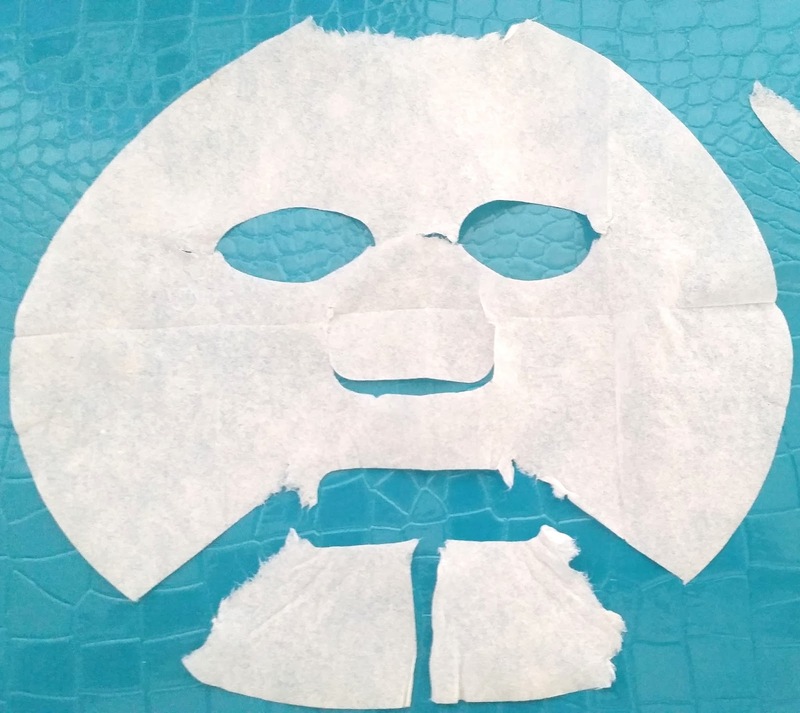 Take the mask out of its packaging and remove its protective layer. Apply the mask onto the face and leave it on for 20 to 30 minutes. Remove the mask and pat in any remaining essence. Use the left over essence on the neck, body, etc. Ingredients: Water, butylene glycol, glycerin, propylene glycol, aloe barbadensis leaf juice, sodium hyaluronate, ananas sativus (pineapple)fruit extract, cucumis sativus (cucumber) fruit extract, laminaria digitata extract, hydrolyzed yeast protein, triethanolamine, phenoxyethanol, chlorphensin, glycyrrhiza glabra (licorice) root extract, codium tomentosum extract, lecithin, polysorbate 80, PEG-15 hydroxystearate, citric acid, hydrolyzed conchiolin protein, polysorbate 20, dipotassium glycyrrhizate, acer saccharum (sugar maple) extract, citrus aurantium dulcis (orange) fruit extract, citrus medica limonum (lemon) peel extract, malva sylvestris (mallow) flower extract, saccharum officinarum (sugar cane) extract, polyglutamic acid, iodopropynyl butylcarbamate, xanthan gum, carbomer, fragrance, sodium hydroxide, potassium hydroxide, glycosphingolipids, tocopheryl acetate. Packaging: I feel a bit repetitive after reviewing the 5th MBD mask because all of their packaging styles are pretty much the same and the only difference is the color, pictures, and names. Anyways, the MBD Black Pearl masks are stored in a black box with the product's name and main ingredient picture in the front. 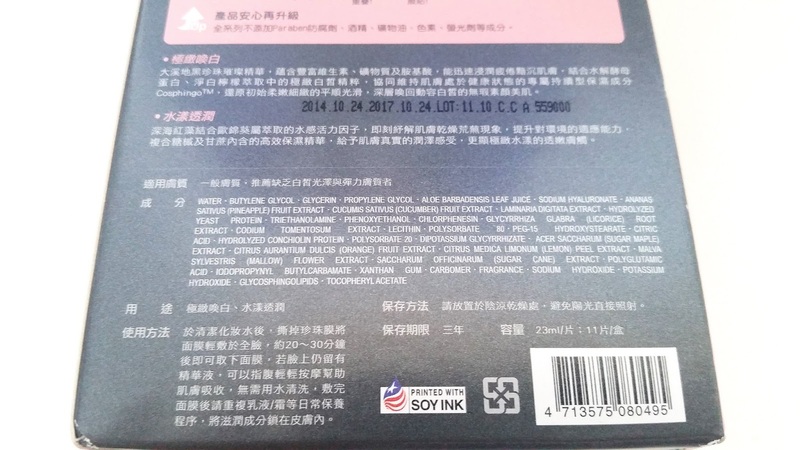 The back on the box contains more information about the product, its ingredients, manufacturing and expiration dates, and information about the company. 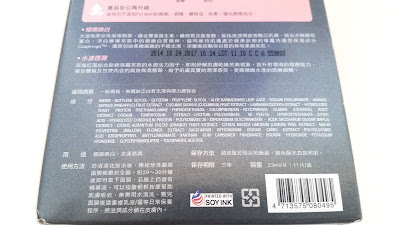 The 2 sides of the box contains even more information about the product and the authenticity sticker. The box shown here is a limited edition box and while MBD masks usually come with 10 masks per box, this limited edition box had 11 masks. All MBD masks are good for 3 years from the manufacturing date. Scent: The mask has a floral scent. It's more than mild but not super strong for me. Fragrance is added to the product. Color: The mask is white in color and the essence is clear. Texture: The texture of the mask is soft and the mask is easily tear-able. The essence is liquidy and has the same consistency as a normal essence or a light serum. My Thoughts: One of the best things about MBD masks is the boat load of essence each mask pouch comes with. The dripping can be a pain but I love using the extra essence on my neck, body, etc. It feels great. Sometimes I even save some essence for the next morning and use it for my essence/serum step. 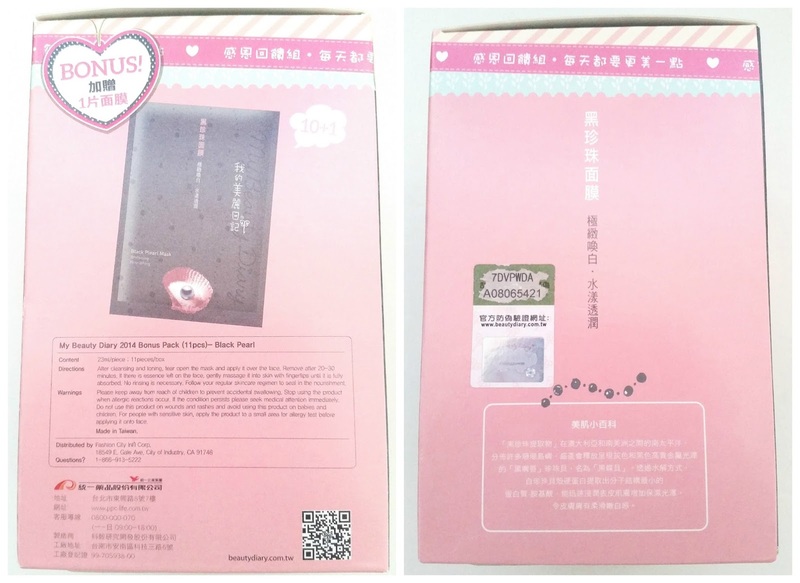 The My Beauty Diary Black Pearl mask has great brightening effects. It's not the best brightening mask in the world but the effects are still fairly noticeable after each use. The effects also usually lasts around a day for me, which isn't bad for the price of the mask. Aside from its brightening effects, the Black Pearl can also nourish the skin, leaving it soft and smooth. It does an okay job moisturizing the skin but I wouldn't reach for this if my skin needs an intense boost of moisture. Undoubtedly, my biggest issue with MBD masks, as I've mentioned time and time again, is its cut and fit. The mask isn't a perfect fit for me and the cuts are a bit awkward here and there, so I almost always make adjustments to make the mask fit better. Another downside is its fragrance. The floral scent is more than mild, although I wouldn't say it's super strong. For those sensitive to scents, this might not be a good option. 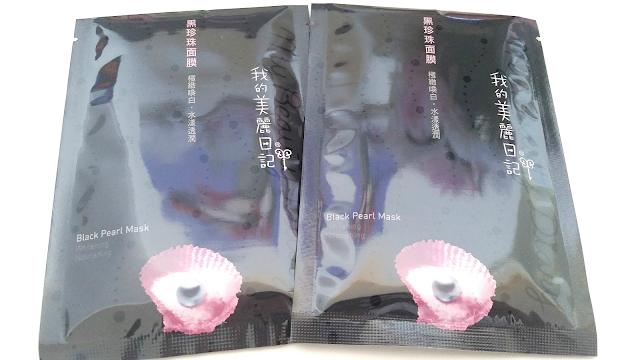 My Thoughts: I do like these MBD Black Pearl masks but I can't say they are my favorite. Having tried other brightening masks, these just aren't on par with those even though they are much cheaper. 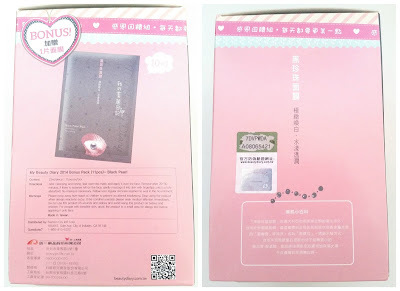 For its price, I think these MBD masks are great and are good for those on a beauty budget. However, if you have the money to splurge, I think there are better masks to try. Would I repurchase these in the future? Possibly. I like to think that I would rather splurge for better than save for just okay. However, splurging might make my wallet and bank sad, so I'm sure there will be times where I want to (need to) save. For those times, I'll probably come back to repurchase these MBD Black Pearl masks because for its price, it works pretty well. Do I think these are worth a try? It depends on your budget. If you are looking for a good brightening mask but want to save some money, then these are worth it. If you have the money to splurge, I think you'll find better elsewhere.